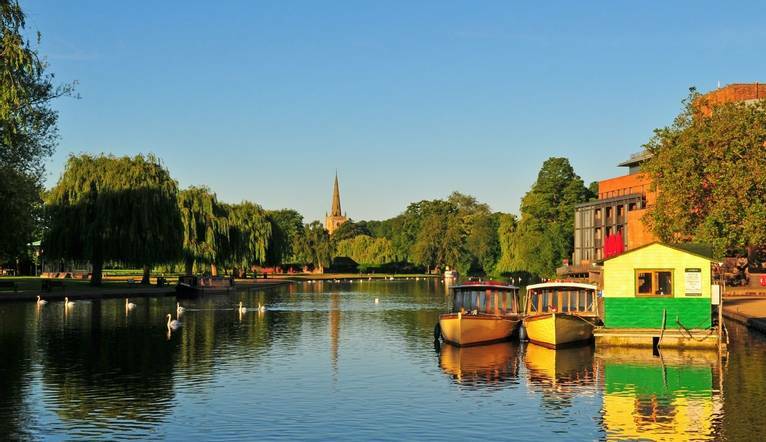 Set on the banks of the river Avon, Stratford-upon-Avon is steeped in culture and history with magical offerings and blends of heritage and drama in Shakespeare's birthplace. 'It is not in the stars to hold our destiny but in ourselves', so let's meet in Stratford-upon-Avon on Friday evening for dinner and a weekend of laughs, stories and friendship. Set in beautiful Warwickshire countryside, discover this delightful riverside town, not only for Shakespeare but also the history of this market town dating back over 800 years. Perfectly located just 5 minutes from the town, we meet up on Friday evening for a welcome drink and dinner. After breakfast the next morning, we meet our guide for a town walk. This is a lovely way to discover Stratford and its fascinating relationship with William Shakespeare. Hear tales of fire, flood, plague, old fashioned sayings, medieval cures and the odd bit of Shakespeare as well. Lasting about 2 hours, we pass the Shakespeare Town Houses (Birthplace, New Place, Hall's Croft), Harvard House, the Royal Shakespeare Theatres, River Avon, 15th century timber-framed buildings, Shakespeare's School, Guild Chapel and Holy Trinity Church. There may be a chance to visit Shakespeare’s grave in the Chancel (small charge) if the Church is open. The hotel is located off Junction 15 of the M40 and the nearest station is Stratford-upon-Avon is a short walk away. Car parking is complimentary. There is often confusion on the question of gratuities, since it frequently depends on the type of holiday, location and, of course, your attitude towards tipping, as to what is normally expected. In order to give you a rough idea, we have given appropriate guidance below. The Tour Leader will be on hand to offer advice or suggestions if required but gratuities are offered entirely at the sole discretion of the individual.We suggest a group collection at the beginning of your holiday to cover drivers, guides and hotel staff (including restaurant, kitchen and reception staff) of approximately £5. Your Tour Leader will collect this on your behalf and distribute it accordingly, thus relieving you of the burden of who, when and how much to tip. The tipping of bar staff and housekeeping will be left to your individual discretion (the rounding up of the drinks bill and a small amount left in your room on departure should cover this and would be much appreciated). As is customary, ‘the hat’ will be passed around for the driver and guide on all optional excursions. For any meals that are not included in your itinerary, restaurants expect a 10% gratuity (do check that service has not already been added to your bill). For taxis 10Ͽf the metered fare.